- Publisher Who Is Going To Heaven? illustrates through a series of heart warming fictional stories how God desires that everyone he ever created has the opportunity to have eternal life in heaven. It proclaims the importance of Christianity being understood by the world not as a narrow, localized, non inclusive religion, but rather God's singular and perfect plan intended for all people. From cave dwellers in France thousands of years ago to a shepherd boy who meets Jesus at the manger, from a laborer on the Great Wall of China to a gang banger on Chicago's west side comes the message of God's love and power.Open your minds and hearts to God's amazing redemptive love. Find out today Who Is Going To Heaven? 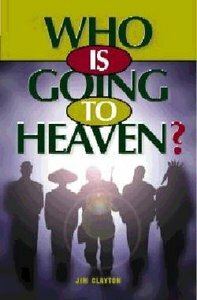 About "Who is Going to Heaven?" Who Is Going To Heaven? illustrates through a series of heart warming fictional stories how God desires that everyone he ever created has the opportunity to have eternal life in heaven. It proclaims the importance of Christianity being understood by the world not as a narrow, localized, non inclusive religion, but rather God's singular and perfect plan intended for all people. From cave dwellers in France thousands of years ago to a shepherd boy who meets Jesus at the manger, from a laborer on the Great Wall of China to a gang banger on Chicago's west side comes the message of God's love and power.Open your minds and hearts to God's amazing redemptive love. Find out today Who Is Going To Heaven?